Delia Bacon, from a daguerreotype taken in 1853. 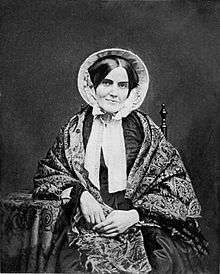 Delia Salter Bacon (February 2, 1811 – September 2, 1859) was an American writer of plays and short stories and Shakespeare scholar. She is best known for her work on the authorship of Shakespeare's plays, which she attributed to social reformers including Francis Bacon, Sir Walter Raleigh and others. Bacon's research in Boston, New York, and London led to the publication of her major work on the subject, The Philosophy of the Plays of Shakspere Unfolded. Her admirers included authors Harriet Beecher Stowe, Nathaniel Hawthorne and Ralph Waldo Emerson, the last of whom called her "America's greatest literary producer of the past ten years" at the time of her death. Bacon was born in a frontier log cabin in Tallmadge, Ohio, the youngest daughter of a Congregationalist minister, who in pursuit of a vision, had abandoned New Haven for the wilds of Ohio. The venture quickly collapsed, and the family returned to New England, where her father died soon after. The impoverished state of their finances permitted only her elder brother Leonard to receive a tertiary education, at Yale, while her own formal education ended when she was fourteen. She became a teacher in schools in Connecticut, New Jersey, and New York, and then, until about 1852, became a distinguished professional lecturer, conducting, in various Eastern United States cities, classes for women in history and literature by methods she devised. At 20, in 1831, she published her first book, Tales of the Puritans anonymously, consisting of three long stories on colonial life. In 1832, she beat Edgar Allan Poe for a short-story prize sponsored by the Philadelphia Saturday Courier. In 1836, she moved to New York, and became an avid theatre-goer. She met the leading Shakespearean actress Ellen Tree soon after, and persuaded her to take the lead role in a play she was writing, partly in blank verse, entitled The Bride of Fort Edward, based on her award-winning story, Love's Martyr, about Jane M'Crea, which she also published anonymously in 1839. The work was reviewed favourably again by Edgar Allan Poe, but proved to be a commercial flop. Returning to New Haven, Bacon met Yale-educated minister Alexander MacWhorter in 1846. Time in each other's company and a trip to Northampton convinced many of the impropriety of their relationship. MacWhorter was brought to ecclesiastical trial by Bacon's brother Leonard for "dishonorable conduct," but was acquitted in a 12–11 vote. Public opinion compelled Bacon to leave New Haven for Ohio, while Catherine Beecher authored a book defending her conduct. Delia Bacon withdrew from public life and lecturing in early 1845, and began to research intensively a theory she was developing over the authorship of Shakespeare's works, which she mapped out by October of that year. However a decade was to pass before her book The Philosophy of the Plays of Shakespeare Unfolded (1857) was to see print. During these years she was befriended by Nathaniel Hawthorne, and Ralph Waldo Emerson, and, after securing sponsorship to travel for research to England, in May 1853, met with Thomas Carlyle, who though intrigued, shrieked loudly as he heard her exposition. This was the heyday of Higher criticism, which was claiming to have uncovered the multiple authorship of the Bible, and positing the composite nature of masterpieces like those attributed to Homer. 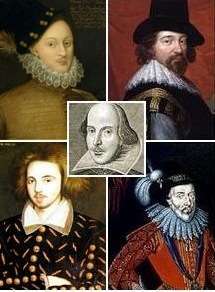 It was also a period of rising bardolatry, the deification of Shakespeare's genius, and a widespread, almost hyperbolic veneration for the philosophical genius of Francis Bacon. Bacon was influenced by these currents. Bacon, like many of her time, approached Shakespearean drama as philosophical masterpieces written for a closed aristocratic society of courtiers and monarchs, and found it difficult to believe they were written either with commercial intent or for a popular audience. Puzzled by the gap between the bare facts of William Shakespeare's life and his vast literary output, she intended to prove that the plays attributed to Shakespeare were written by a coterie of men, including Francis Bacon, Sir Walter Raleigh and Edmund Spenser, for the purpose of inculcating a philosophic system, for which they felt that they themselves could not afford to assume the responsibility. This system she set out to discover beneath the superficial text of the plays. From her friendship with Samuel Morse, an authority on codes, and encryption for the telegraph, she learnt of Bacon's interest in secret ciphers, and this prompted her own approach to the authorship question. James Shapiro interprets her theory both in terms of the cultural tensions of her historical milieu, and as consequential on an intellectual and emotional crisis that unfolded as she both broke with her Puritan upbringing and developed a deep confidential relationship with a fellow lodger, Alexander MacWhorter, a young theology graduate from Yale, which was subsequently interrupted by her brother. MacWhorter was absolved of culpability in a subsequent ecclesiastical trial, whose verdict led to a rift between Delia and her fellow congregationalists. little clique of disappointed and defeated politicians who undertook to head and organize popular opposition against the government, and were compelled to retreat from that enterprise.. .Driven from one field, they showed themselves in another. Driven from the open field, they fought in secret. The cenacle opposing the 'despotism' of Queen Elizabeth and King James, like the knights of King Arthur's Round Table consisted of Francis Bacon, Walter Ralegh, and, as far as Shapiro can make out from her confused writing, perhaps Edmund Spenser, Lord Buckhurst and the Earl of Oxford, all putatively employing playwriting to speak to both rulers and the ruled as committed republicans vindicating that cause against tyranny. She had, in Shapiro's reading, a 'revolutionary agenda' that consisted in upturning the myths of America's founding fathers and the Puritan heritage. How can we undertake to account for the literary miracles of antiquity, while this great myth of the modern ages still lies at our own door, unquestioned? This vast, magical, unexplained phenomenon which our own times have proceed under our own eyes, appears to be, indeed, the only thing which our modern rationalism is not to be permitted to meddle with. For, here the critics themselves still veil their faces, filling the air with mystic utterances which seem to say, that to this shrine at least, for the footstep of the common reason and the common sense, there is yet no admittance. Emerson, who greatly admired Bacon, and who was sceptical of her claim, wrote that she would need 'enchanted instruments, nay alchemy itself, to melt into one identity these two reputations', and retrospectively remarked that America had only two "producers" during the 1850s, "Our wild Whitman, with real inspiration but checked by [a] titanic abdomen; and Delia Bacon, with genius, but mad and clinging like a tortoise to English soil." Though he was intrigued by her insights into the plays, he grew sceptical of the 'magical cipher' of which Bacon wrote without ever producing evidence for it. According to Whitman, himself among the most outspoken of 19th century anti-Stratfordians, she was "the sweetest, eloquentist, grandest woman…that America has so far produced….and, of course, very unworldly, just in all ways such a woman as was calculated to bring the whole literary pack down on her, the orthodox, cruel, stately, dainty, over-fed literary pack – worshipping tradition, unconscious of this day’s honest sunlight." For too long critics have depicted [her] as a tragicomic figure, blindly pursuing a fantastic mission in obscurity and isolation, only to end in silence and madness….this is not to say that the stereotype is without basis. On the contrary, her sad story established an archetype for the story of the Shakespeare authorship at large – or at least one element of it: an otherworldly pursuit of truth that produces gifts for a world that is indifferent or hostile to them. James Shapiro argues that her political reading of the plays, and her insistence on collaborative authorship, anticipated modern approaches by a century and a half. Had she limited her argument to these points instead of conjoining it to an argument about how Shakespeare couldn't have written them, there is little doubt that, instead of being dismissed as a crank and a madwoman, she would be hailed today as the precursor of the New Historicists, and the first to argue that the plays anticipated the political upheavals England experienced in the mid-seventeenth century. But Delia Bacon couldn't stop at that point. Nor could she concede that the republican ideas she located in the plays circulated widely at the time and were as available to William Shakespeare as they were to Walter Ralegh or Francis Bacon. There is a biography by her nephew, Theodore Bacon, Delia Bacon: A Sketch (Boston, 1888), and an appreciative chapter, "Recollections of a Gifted Woman," in Nathaniel Hawthorne's Our Old Home (Boston, 1863). She died in Hartford, Connecticut. Bacon and her theories are featured heavily in Jennifer Lee Carrell's novel Interred with Their Bones. She is interred in Grove Street Cemetery in New Haven, Connecticut. 1 2 3 4 Schiff, Judith Ann (November 2015). "A genius, but mad". Yale Alumni Magazine. Retrieved 19 December 2015. ↑ Delia Bacon, “William Shakespeare and His Plays: An Inquiry Concerning Them,” Putnam’s Monthly, VII: XXXVII (January 1856): 1-19. ↑ Ralph Leslie Rusk, The Letters of Ralph Waldo Emerson, New York: Columbia University Press, 1966 Vol. V, 86-87. ↑ Cited in Paul A. Nelson, “Walt Whitman on Shakespeare,” Shakespeare Oxford Society Newsletter, Fall 1992 (28: 4A), 2. ↑ Warren Hope and Kim Holston, The Shakespeare Controversy: An Analysis of the Claimants to Authorship, and Their Champions and Detractors. Jefferson, North Carolina: McFarland & Co, 1992, 1. Bacon, Theodore (1888). Delia Bacon, A Biographical Sketch. Boston and New York: Houghton, Mifflin and Co.
Hopkins, Viviane Constance (1959). Prodigal Puritan: A Life of Delia Bacon. Cambridge, MA: Harvard University Press. ISBN 9780674498631. "Delia Bacon, The Woman Who Hated Shakespeare" from Scandelous Women. The Philosophy of the Plays of Shakspere Unfolded at Google Books. This article is issued from Wikipedia - version of the 8/28/2016. The text is available under the Creative Commons Attribution/Share Alike but additional terms may apply for the media files.